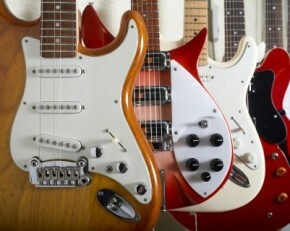 Most of us readers at Gear Vault remember what age we started playing guitar and what kind of guitar we played. 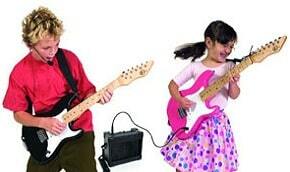 But many parents are stumped on which kids guitar to get their youngster. Rather then buy your child the ever so popular ‘Guitar Hero’ TV game system, why not persuade them to play the most popular American instrument, the guitar. Hopefully this article will shred light on a difficult decision on which kids guitar to purchase. 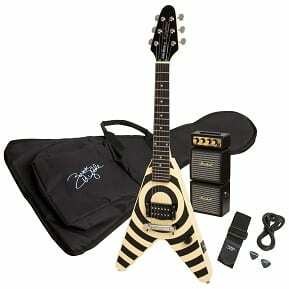 Pictured is a kids Epiphone Flying VeeWee Rave guitar rig. First of all, you have to choose between an acoustic and an electric. This can be quite simple – just show your child pictures of both and give examples of how each of them sounds, or pay attention to kind of music your child prefers. Both electric and acoustic guitars have there advantages and disadvantages. Smaller acoustic guitars are harder to come by than 3/4 sized kids guitars, but there is little difference in price. As a rule, 3/4 electrics and acoustics are for children from 6-11 years, and 1/2 acoustics and electrics are for children aged less than 6 years. 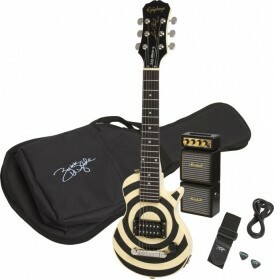 For a more valuable investment, you can also get a 7/8 sized guitar for a 10 year old, because the child can actually grow with of the instrument. The Squier “Mini” is a solid and reasonably-priced 3/4 sized guitar. Along with three-coil pickups (so the child never gets bored, even when dashing the strings ad infinitum) and a pinned non-tremolo bridge, this Strat also makes use of the “cool factor”, which you can’t keep amiss when buying stuff for children. Overall, the Mini is as close to a real sized guitar as you can get for your kid, hence Squier (though Ibanez has the GRGM21) is the only other company that manufactures quality kids guitars. The Squier MC-1 is a 3/4-size nylon-string mini classical guitar for kids and has a great sound you wouldn’t expect for the price. The neck is considerably thinner than that of a regular acoustic, and the size is just right for kids. If you are about to send your child to music school, the alternative nylon string model MA-1 is a safe pick. And lastly, if you have a daughter, she will love Daisy Rock which is available in blue and candy sparkle colors. 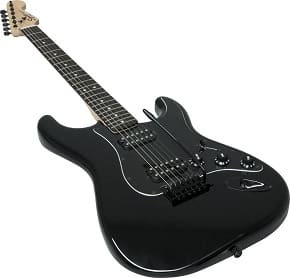 The other models are contemporary and look like one would expect from a girl-guitar company; their thin necks make it easy even for smaller fingers to move around the fretboard. But we do believe that these instruments are good kids’ guitars, and all cost around or below $100 – except the blue sparkle, which makes up for it with its shininess. But take time and do some of your research to make the best decision for your kid’s first guitar. They will remember it for the rest of their lives. 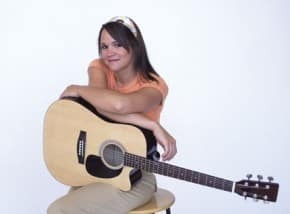 Interesting that your article about choosing a kids guitar, would mention only well known guitar companies that have lines in that specific product. I am as frugal as they come, (in this day and time I suppose everyone is or at least trying to be.) And when I was to buy my six year old Granddaughter a guitar I investigated intensely until I found (which we thought was the perfect guitar for her). I made a good choice, got a good deal, she still Love’s it enough to practice at least 15 minutes a day. I don’t know if it’s against the rules of your site to mention another source when buying this product, but a couple of years ago I stumbled upon a pretty neat site while web-surfing, named SmallGuitars.com. As said it’s a pretty neat site and has some great guitars/basses for kids of all ages. Maybe this info will also help some of those parents out who are stumbling on which kids guitar to buy. Just a added thought…and not to be nit-picky about your statement “the most popular American instrument,the guitar”, but, I read an article about a year ago, that the (now hold on to your hat’s)most popular instrument, not only in America, but the world, is the Harmonica. Now this was not an opinion of the author but, a fact. The article stated that it sells more units year in, year out, world wide than any other instrument made. Maybe it is deemed the most popular due to sales, more than the love of the instrument itself. Some very good points made……understood. There are other guitars that aren’t full sized, some expensive and some not. Yamaha, Taylor, Rickenbacker 325 is short scale.